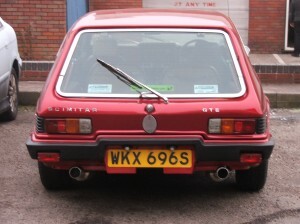 It’s amazing that a car built in such relatively low numbers and with such striking styling should still be so cheap. 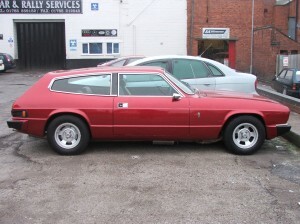 The Scimitar was such a departure for Reliant and has carried it’s age well thanks to the fibreglass body. There may be nothing groundbreaking about the mechincals but thanks to some very strong parts being carfully borrowed from other manufacturers they are tough and pretty reliable as classics go. This car was bought for only a few hundred pounds but since then we’ve done some serious work done. 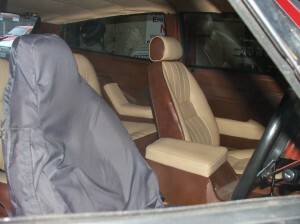 Cosmetically it’s had a full respray, new carpets, the seats have been leathered and the headlining replaced to match. 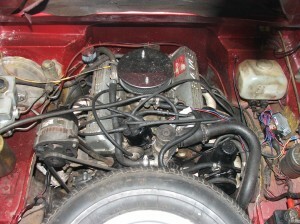 On the mechanical side of things it’s had a rare South African motorcraft 3.4L engine fitted. We’ve added some custom stainless exhaust manifolds and a full stainless system. It took 6 exhaust boxes in total to quieten everything down! 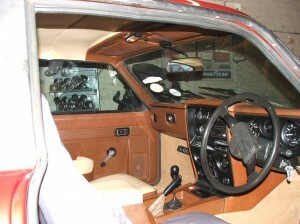 It’s had lot’s of other bit’s a bobs like a dose of waxoyl and a full brake strip and reseal. Parts aren’t available for ars this age so everything had a clean up and new seals. In the end the master cylinder was modified to take one from a transit. I’m sure there wll be more improving to be done soon. Web Design by Rapid Web ltd Terms and Conditions Copyright ©2009 All rights reserved.